I know many Shizugisa supporters will kill me if I post this at this point of time but ... I just gotta post it!!! 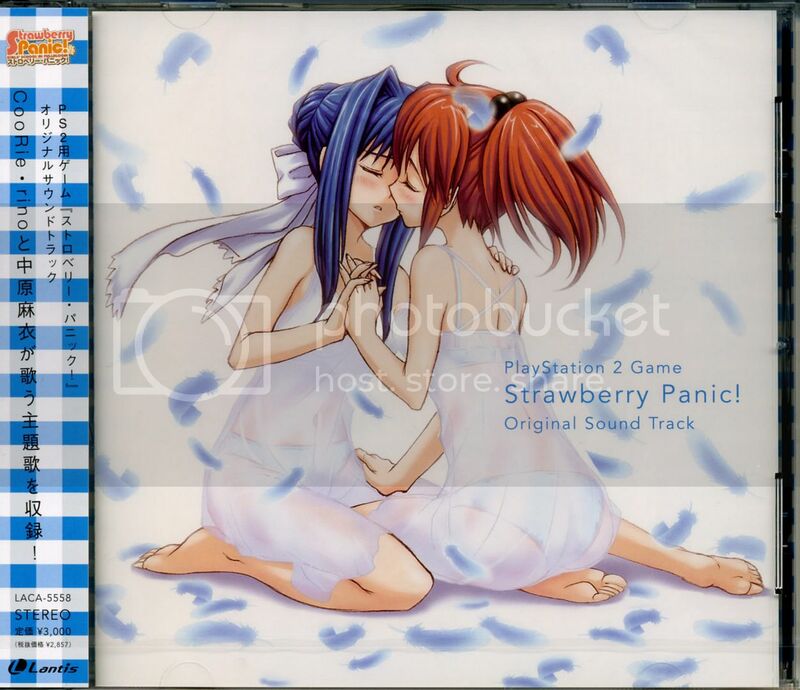 LoL alright, you can purchase the PS2 Game Strawberry Panic! OP & ED & OST CD at your friendly amazon link. Anyways, it's already out on 21 September 2006, I'm just slow. 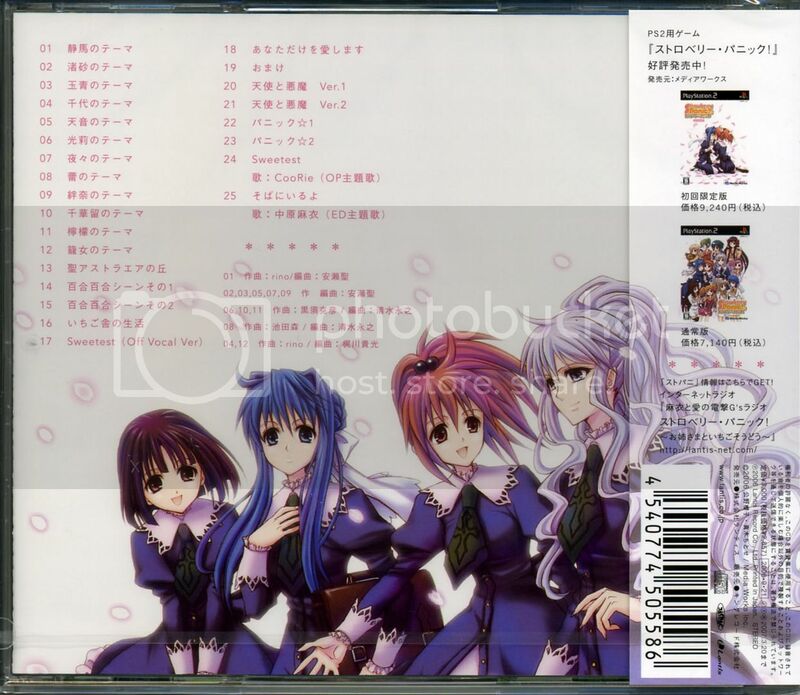 The OP and ED of the PS2 is included in this CD, so it's worth to purchase it =). The OP's by CooRie while the ED's by Nakahara Mai, the seiyuu of Nagisa. Even if you don't have a PS2 to pay the game with ... you can listen to the OST instead =) [Like me]. Wanted to post this up last night but something's wrong with the stupid connection again ... the DSL can't freaking connect even after 1 hour ... what the hell? Connection's alright early morning, late at night ... You know, nothing piss me off more than not connecting to the internet. GRRRR, I'll call singnet tomorrow. WHOA, I just got a miss call from this stupid spam number which it will incur high idd charges if you call back. So if you get a miss call starting with +861, DO NOT CALL BACK! [It's like some overseas call number] Do not take the call too, cos it's like ringed less than 1 sec and just miss call already. So pass it to your friends if you're in Singapore. Anyways, update in my life, I'm going to out this afternoon to Seoul Gardens for bbq with the usual tb14 girls =) it's been hm a while since we last met or rather I met them lol. Would going to Japan to pick this game (special Edition, of course) and a PS2 up, seem weird? To Anonymous 2: Where did you heard of the yuri scene?! I don't remember hearing about the game being an H-game! to anonyomous, eh no? If you're rich... lol. to Wing of Light and anonyomous, don't think there's any yuri scene, it's just the title says 'Yuri Scene' doesn't mean it's yuri scene lol ... bleh, I dunno. Ask those who played the PS2 game. to anonymous, there is. Or you can search for Serin or check their website for link. It's going to be hard to follow me so here goes, I already play the game and I recognize the yuri scene songs. Heres how the game work, you must make Nagisa, Hikari, or Kizuna(I'll refer from now on as YOU) close to a girl. When you play the game, you'll realize there're a lot of different path to choose from. If you chose the right path, then you'll be treated to a picture with YOU and a girl, then the background song plays from there. One more time, It's important to collect pictures in the game because it'll go to the CGs collection menu, which allows you to view the pictures anytime you want, so you don't have go thru all that trouble on story mode again.